The latest Follow That Dream CD - "Good Times" has been released. This edition is a 2-disc set in the Classic Album Series. Originally released in 1974, this great album features the legendary “Good Time Charlie’s Got The Blues”, “My Boy” and “I’ve Got A Thing About You Baby”. In addition to the masters, it will contain many outtakes from the Stax Sessions of 1973. The package is a 7” inch digi-pack with a 12-page booklet. Well if ernst talked to anyone maybe you could find out why they even messed with girl happy,and yet Elvis today still has the less than best sound,not the way a collectors label should act! Amen !!! They re-release "Girl Happy" - I think TODAY should be re-released with better mastering. Hey Ernst, how about it ? The album is too good not to be treated as such. I agree Rob V, Today stands out for the wrong reasons, unfortunately. I wish Sebastian Jeansson or Jean-Marc Juilland remastered "Elvis Today". Fantastic FTD. All the outtakes of My Boy and hear Elvis rehearsing Loving Arms, with a totally different ending. But the biggest highlight is Good Time Charlie's Got The Blues. I haven't listened to the entire CD yet, (Christmas kind of gets in the way! ), but am really impressed. By the way, the disc has been mastered by Jean-Marc Juilland, who also mastered FTD's brilliant Raised On Rock, so expect the best! Highy recommended. Well, I am still waiting for "Good Times", but I hope the double set is fine. So last but not least from Stax Recording Studios is "Promised Land", which I hope will be released before April next year! Mr. Jorgensen ? But "at the time of year as it is" I would expect FTD to release "Elvis sings the Wonderful World of Christmas" in their Classic Album serious. Since we know there are outtakes, this could be a nice Christmas present for next year! Mr. Jorgensen ? Nothing special, really but OK + thanks to Ernst anyway. Is it so that we may expect NOW and From EPBlvd in Feb 2010 ?? Heared that Ernst contemplates to release the next NOW double CD on FTD with bonus songs like Kent Rain, It's only love, Sep Ways, Am Trilogy and Matter of time; can someone confirm or deny this ??? I liked the various outtakes of Charlie&Blues and If that isn't love on this CD, expected more from Take good care of her & Loving arms...more C&Wsteel guitar versions (like There goes everyth or Just call m lonesome....!!) Too bad they did not elaborate more on those songs. Spanish eyes misses in my opinion that greatness of sound & instruments that had also KissMeQ (Floyd's brilliant piano and also the ticks on wood that creat that latin sound.....that would have made it again Billboard's Number One !!!!) Gordon Stoker feels the same about it ! Good Time Charlie's Got The Blues is a longtime favourite of mine...He should have played Talk About The Good Times on stage! 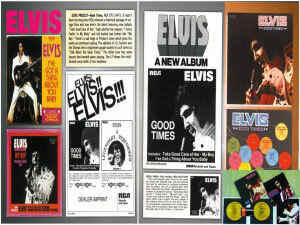 On the assumption the upcoming 10 re-issues also come to England, we will have a choice of two versions of "Good Times". But does anyone actually know if we are getting these budget price re-issues over here? They are going for $6.98 on Amazon.com! I can't wait! Please, please be as good as FTD's Raised On Rock! On time! This proves that Santa Claus exists!